The internationally praised Executive Orders signed by President Obama on his first day in office to close the illegal prison in Guantánamo missed its deadline last week. But that was old news. It was clear from early on that the closing of Guantánamo, as well as the ending of other Bush era policies in the “War on Terror,” were not going to be much more than a face-lift. An Obama-appointed Task Force, led by the Justice Department, just finished a collaborative effort in re-reviewing (including the men at Guantánamo cleared for release by the Bush Administration’s standards) the cases of all the remaining men at Guantánamo. What did they find? The results are quite staggering and depressing and confirm the continue need for action, witness and pressure against torture and the condition that allow it to happen. Of the 198 men (now 196 after two Algerian men were released on January 22, 2010) it was reported that “nearly 50 should be held indefinitely without trial under the laws of war,” according to The Washington Post. As Andy Worthington correctly notes, such indefinite detention is not only legally dubious, it “rubs salt in Guantánamo’s wounds” by announcing such findings on the anniversary of Obama’s missed deadline. And yet, 110 men are cleared for release, many for the second time, but remain indefinitely detained as the question of where these men are “allowed” to go is resolved. Repatriating or resettling these innocent men – letting these men go free – is difficult because the United States refuses to take any of them and is stringent in allowing men to return to the Middle East because of unsubstantiated claims of “recidivism.” Succumbing to the fear-mongering, the U.S. Congress has barred the settling of innocent men from Guantánamo into the United States. The vote, which passed the Senate 79-19, effectively tied Obama’s hands from making the simple gesture to primarily European nations that the United States is willing to clean up its own mess. We fast because it makes us more human, makes them more human. Dorothy Day, the co-founder of the Catholic Worker, often extolled the “weapons of the spirit, [the] denying of ourselves and taking up our crosses” as the foundation for radical social change. Gandhi urged his followers to fast to reiterate the need to be nonviolent. We fast because it draws us deeper into nonviolence and emboldens us for public action and civil resistance. Throughout our 12-day fast, many of us expressed a deeper solidarity with the men at Guantánamo than we had experienced before. Only a handful from Witness Against Torture have traveled to Cuba to try to visit the prison. Very few of us have been able to share in dialogue and community with the men imprisoned there, as we are not lawyers. 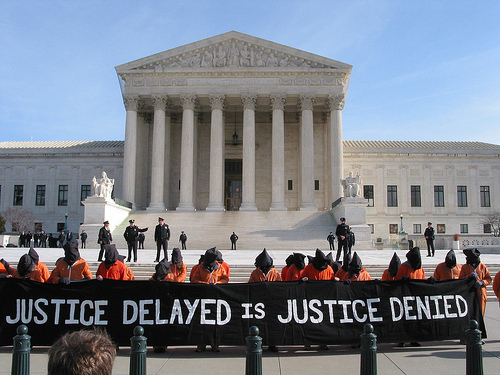 We fast and protest because indefinite detention, torture and extraordinary rendition are always wrong. We fast and protest because we want to live in a world not ruled by fear but by courage. And so, while our bodies may be weakened by the fast, our spirit and our resolve are strengthened to hold on, to keep fighting, to keep protesting because one day justice will flow like a mighty river and our brothers at Guantánamo will be welcomed at our table. I recently came across your blog and get been reading along. I thought I would leave my first comment. I do not understand what to say except i have enjoyed reading. Terrific blog. I will keep visiting this site very often.